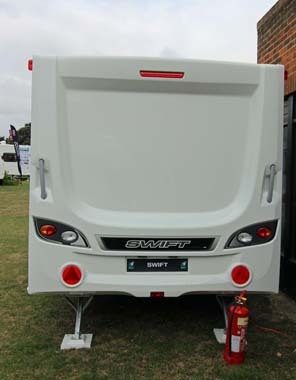 The Swift Challenger SE 565, like its 2014 stable mates, is built using the company’s SMART construction system which is based on proven technology and provides a Strong timber-less body frame with Modern desirable looks and a leading Aerodynamic shape that is highly Resilient to moisture, all wrapped up in a caravan that has undergone the most comprehensive Testing. 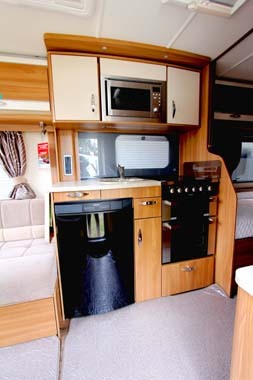 It’s a single axle four-berth caravan with fixed single beds, an end washroom offside kitchen and parallel seating in the lounge area. The kitchen has a granite effect round sink set in a coordinating worktop, with a free-standing drainer, set against a splash back. With the hob, oven, grill and microwave you’re good to go with that handy and easy-to-follow recipe. There are plenty of storage cupboards for ingredients and crockery and if you need a tad more workspace there is a handy lift up worktop extension to the left of the sink. We liked the mood lighting under the worktop. Heating and hot water is provided by a digital programmable Alde wet radiator system. The shower room has a handy hanging rail, over the shower, back lit mirror and an Alde heated towel radiator. The fixed single beds are slightly different sizes; the offside bed measures 1.92m x 0.68m and the nearside 1.83m x 0.73m and each has a Duvalay Duvalite mattress as standard. 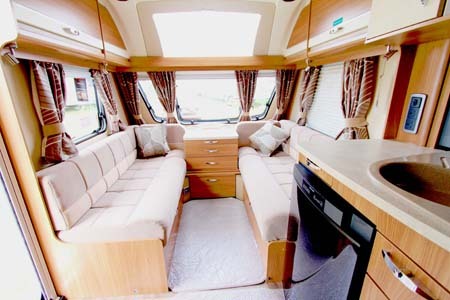 For cosy evenings, or when you just want to put your feet up, there is a television bracket, aerial and convenient power point on the nearside. With a fixed twin bed layout, living is easy yet flexible and the lounge end can be used as two more single beds, ideal for children, or as a decent size double bed. The centre chest of drawers of course has a pullout table and there is a freestanding table too. ‘Mali Acacia’ wood grain is used for the cabinets and upper lockers at the front have a contrasting trim with chrome handles; new French Oak-look scratch resistant floor lino is covered with drop-in carpets and a soft furnishing colour scheme called Kitami is standard, but the model we saw had Impala wipe clean upholstery. Its green credentials are good to see with low energy lighting; there are over locker lighting and LED task lights, an Eco Camel water and energy saving shower head and a roof mounted 40W solar panel. Security has been well thought out as there is a Thatcham Approved TRACKER Retrieve, AL-KO ATC trailer stability control, Al-KO AKS 3004 Stabiliser and a passive infra-red alarm system with tilt sensor and key fob operation fitted as standard. A receiver for the optional AL-KO Secure portable wheel lock has also been fitted and if you purchase the wheel lock, your insurance company may well consider this as a good precaution against theft. These devices can help to reduce your premium, see our caravan security discounts page for details. 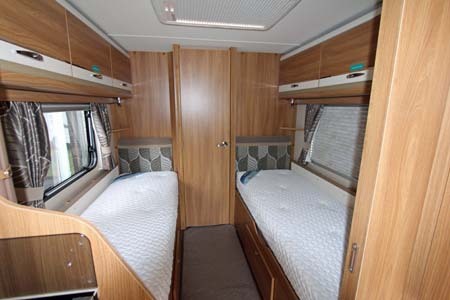 It’s a mid-range model and fixed single beds are a popular layout. Most are bought by couples who want the convenience of not having to deal with bedding twice a day and they are easy to make up. The caravan has a good use of space and colour. For more information on the Swift Challenger, visit the Swift website. 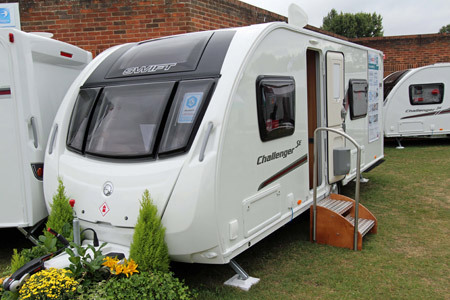 **Price is ex-works and includes VAT @ 20% but excludes a recommended retailer delivery charge of £545 including VAT which includes delivery to your supplying dealer and preparing your caravan for collection by you. This is not meant as a criticism only a perhaps a few practical suggestions having now owned this Swift “Iona” for 18 mths. but having caravanned since 1969. 1. Clothes lockers too narrow for folded shirts.2.Kitchen cupboards could contain the odd shelf.3.Water heater switch is often kicked off, perhaps a slight relocation?4. Group all the locker water heater, security boxes etc. into one area to allow full space for storage.5.Double glazing continually misting is a problem.6. Poor quality front locker locks. Otherwise a great van to tow!! Great suggestions thank you. It’s always good to hear feedback from owners! In response to your email i find it an insult that you should demonstrate your 2014 model to us having just purchashed a 2013 swift challenger sport 554 in february 2013 witch we are completely happy with for a substansiable amount and now you are marketing the 2014 models to us like we are made of money.PUT A STOP TO IT NOW as i feel like you are taking us for a ride. Thanks for getting in touch. I must make it clear that this is an independent review and is in no way a marketing tool for Swift. 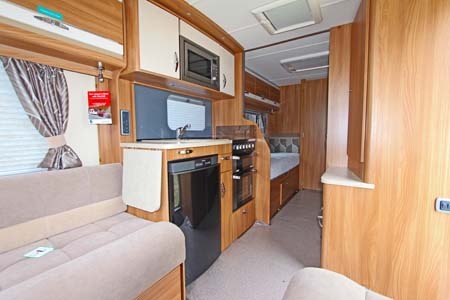 We like to showcase the latest models to our e-magazine subscribers to show the range of caravans and motorhomes available to them. 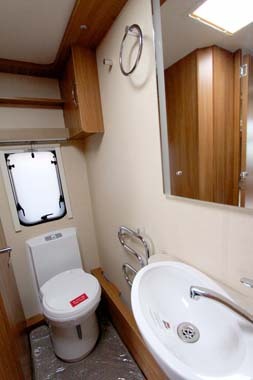 2014 Challenger 565 (like Sterling Solitaire) has not dealt with glaring layout problems of 2013 models – fixed beds too high in relation to windows resulting in damage to blinds, and wc space has totally inadequate “elbow room”. Hope also that push-fit plumbing fittings have been improved so that they don’t pop off under pressure and flood caravan repeatedly.